On May 25th, 2018, the 74-year-old undocumented Chinese immigrant Yuxian Guo went to Gouverneur Hospital because of a strong and continuous feeling of nausea and dizziness. It was the first time Guo went to a public hospital since he came to America in 1997, and it was the first time that he felt he was so close to death——Four months later, he was diagnosed with gastric cancer metastasis to pancreas. Guo did not go see a doctor or go to a hospital because he thought he was not entitled to health care and might even risk being deported if he asked for help. . “I thought as an undocumented immigrant in America, I can only count on myself,” he said. The symptom of nausea and dizziness has lasted for a long time as well. When Guo felt dizzy and nauseous, he used to go to a pharmacy in Chinatown to buy some antiemetic drugs. Guo usually felt better after taking the drug, but not for this time on May 25th. After taking the antiemetic drug, Guo still felt “the whole world is spinning”. He cannot stand and sit steadily. He quickly held the edge of his bed and lay down. “It doesn’t feel right,” Guo realized something was wrong. He didn’t remember how long he had waited on his bed. The first thing he did after he was able to get up was going to Gouverneur Hospital, the nearest public hospital to him. It turned out that the symptoms of nauseousness and dizziness was from hypertension. However, the symptoms in Guo’s stomach also drew doctor’s attention. The doctor suggested Guo to do a gastroscopy, the earliest availability of which was September 21, 2018. During the process of gastroscopy, Guo stared at the monitor screen. “I saw there were several black areas in my stomach. I know it is not a good sign.” Guo recalled. The procedure images showed that there were masses in Guo’s gastric antrum. Guo was then required to do a biopsy. 9 days later, Guo was notified that he got gastric cancer with possible metastasis, which was later found as pancreatic metastases. The doctor estimated that Guo’s life may only last for 6 months without any treatment. A Chinese social worker translated what doctor said into Chinese to Guo, Guo’s mind went blank, “I was totally shocked, I didn’t expect that I could get cancer and it could be so severe.” Guo regretted that he didn’t pay attention to the initial symptoms and didn’t go to see a doctor in time. He hasn’t seen his families back in China for 22 years, and he still has some unfulfilled wishes, he doesn’t want to die. But when Guo turned to 68 years old, he found that he cannot do construction work as easily as before. With a little saving and very low income from other activities, Guo was struggling to make ends meet. Without any families in America, he stays at a “hotel” on Bowery Street in Chinatown, a loft that has been divided into blocks of cubicles and the monthly rent for a bed is around $150. Guo’s cubicle is barely wider than a full mattress, full of smell of smoke and musty odor. Cockroaches can be seen on the wall, his bed and desk. Under such circumstance, seeing a doctor is a luxury for Guo. “If my immigrant status is legal, then I can get affordable healthcare insurance. I wouldn’t have to wait so long to see a doctor. At least I can have annual check-up and it would not end up like this now.” Guo sighed. Although the Affordable Care Act provides benefits to U.S. citizens and present legal immigrants, but it specifically prevents undocumented immigrants like Guo from enrolling in overage through the exchanges. Under federal guidelines, the undocumented immigrants are also not eligible for Medicaid. It almost gives non-lawfully present immigrants no choices but to cut the expenses of healthcare from their budget. In fact, Guo could have avoided facing the threat of death. In New York City, If a patient like Guo does not qualify or cannot afford any of the free or low-cost health insurance plans available, he or she may qualify for NYC Health + Hospitals Options—a free or discount payment plan to make health care services affordable for him or her. 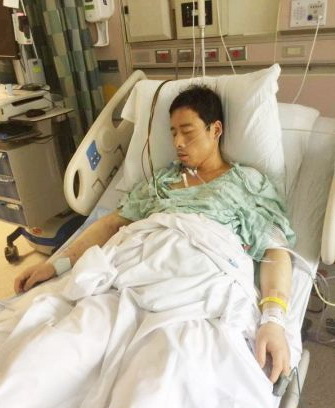 Fortunately in the misfortune, under the help of a social worker assigned by the hospital, Guo was found that he is eligible to apply for Medicaid for the treatments of an emergency medical condition, no matter he is a lawful immigrant or not. Medicaid payment is provided for care and services necessary for the treatment of Guo’s emergency medical condition. Guo received a free gastric surgery in Bellevue Hospital in November and now participates in a clinic trial by New York University School of Medicine for of Pembrolizumab plus chemotherapy versus Placebo plus chemotherapy as neoadjuvant/adjuvant treatment for subjects with gastric and gastroesophageal junction adenocarcinoma. Guo said he chose to participate in the clinic trial voluntarily, “I know that I am getting the benefits from American healthcare system. I want to make some contributions to medical research. If the clinic trial turns out to be successful, it will save more lives. If it fails, I won’t feel regret. I just hope I can go back to China before I die.